Are you wondering what’s essential for you to do to add social media marketing to your marketing plan this year or quarter and beyond? 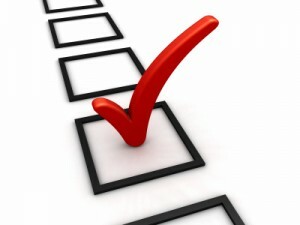 Here are some of the essentials in the form of a social media marketing checklist for you. A downloadable version our Social Media Marketing Checklist for Small Local Business is available as a PDF by clicking here. Are you gathering and organizing your customer contact information and sending out email regularly to stay in touch? Do you have a Facebook profile and customized Facebook Page (business fan page) where you engage with prospects and customers? Have you located at least one niche marketing site where you participate and network regularly? Have you claimed your local search listings (e.g. Google Places, Bing Local, and Yahoo Local) and optimized your traffic by creating short, juicy marketing profiles? Do you have a prospect-attracting, well-designed and flexible web site to function as the hub (or home) for your Social Biz network? Does your web site have a blog with regularly updated customer-attracting information? Are your web pages designed to make it easy for people to join your marketing list, join your social networks and share your information with others? Are your profiles, social networking sites, marketing hub (blog) and other internet marketing locations linked together to move visitors into and through your marketing pipeline? Are you using browser and social media tools to reduce social media time and effort? Are you using both online and offline marketing methods, working together, to generate traffic that flows into your marketing pipeline? Do you have a system for staying in touch with your Social Biz communities and for follow up with prospects and customers? 1-3 You don’t YET have a Social Biz foundation for using social media as a real marketing tool to grow a business network and sell more products/services. 4-8 You ARE attracting prospective customers/clients and building a marketing list. You’re selling some products/services and building a network. 9-10 Congratulations! You are well on your way to Social Biz SUCCESS! You are gaining influence, growing a large business network and selling more products/services. I’ve enjoyed the Ultimate Blog Challenge. Although I don’t have a business, one never knows when life will put me in the position of either wanting to start one or needing to start one. I’ve been exposed to a lot of blogs with good business information and insights – resources I now know about in case I ever need them. Kate, I’m visiting from the UBC. I love this post! What a great checklist! I had completely forgotten about a couple of the items on your checklist that seemed so pressing last time I thought of them. Now what is a niche marketing site? For me as a stress management trainer, how would I determine a good one to cultivate? I’m so glad I found you thru the UBC. I’m subscribing. Thanks for your comments and feedback. A niche marketing site is a “place” where you could expect to find your ideal clients or your ideal referrers. Start by looking for groups at Facebook and LinkedIn. Also look for membership sites where you could participate as a resource for people (or organizations) that might need your services — or would refer clients to you once they “know, like and trust” you. Thanks for subscribing. I have a new newsletter about to launch and I hope you’ll give me some feedback. Meanwhile, expect blog updates about twice a month. Great list Kate! There are some great tips in here (I say that as a social media specialist AND the owner of a location-based “offline” business – aw wellness practice) – I love that you mentioned a mix of online and offline marketing) – thanks for sharing. I will bookmark this!